You may hear about the term VPU in the recent news. But, many of you don't know what actually VPU is. So, let's find out. VPU stands for Vision Processing Unit, which is an emerging class of microprocessor. It is a dedicated Neural Compute Engine to deliver artificial intelligence compute capabilities to edge devices, in a low-power, high-performance package. It's a specific type of AI accelerator. VPUs are specially designed to accelerate machine vision tasks, such as identify images, words, or analyze video. VPUs are distinct from video processing units or graphics processing units, which are specialised for video encoding and decoding. It provide suitability for running machine vision algorithms over GPUs. Target markets of VPU are robotics, the internet of things, digital cameras for virtual reality and augmented reality, smart cameras, and integrating machine vision acceleration into smartphones and other mobile devices. The Vision Processing Unit is a dedicated camera-assisting hardware unit that can perform real-time processing functions. They were typically assigned to CPU or GPU before, but the VPU only uses a tenth of the power for the same task. The Vision Processing Unit provides a platform that allows brands the ability to customize camera functionality and drive product differentiation. MediaTek has already gathered considerable 3rd party application support, giving great product differentiation opportunity. The Vision Processing Unit can still be used in isolation or as part of a team with the CPU/GPU; a truly heterogeneous computing environment on the same memory subsystem for advanced multi-application or multi-function tasks. 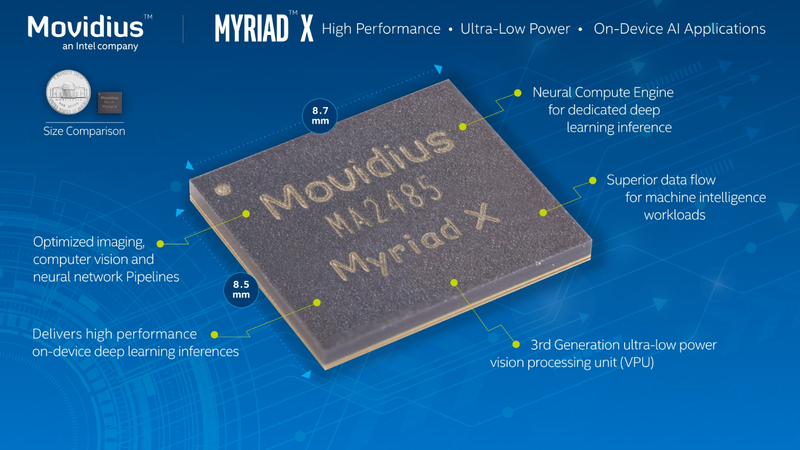 After accruing Movidius, Intel announced the world's first Vision Processing Unit - The Movidius Myriad X. The chip is designed to be a power-efficient solution for vision and artificial intelligence applications in devices like drones, smart cameras, security systems, VR/AR headsets, 360 cameras, and related products. Movidius aims to infuse AI capabilities into everyday devices through several of its initiatives. AI is broken up into two steps - Deep learning consists of feeding data into a machine learning algorithm so it can train itself to accomplish a task, such as identifying images, words, or analyze video. The Myriad X combines dedicated imaging, computer vision processing and neural compute engine to provide high-performance deep learning inference, and the results are opening up new realms of possibility.